The rectangular-cut, 18.96-carat, fancy-vivid-pink stone went for $50.4 million at the auction Tuesday, becoming the most expensive pink diamond Christie’s has sold, the auction house said. At $2.7 million per carat, it also achieved a world-record average price for a pink diamond at auction, beating the 14.93-carat Pink Promise, which fetched $32.5 million ($2.1 million per carat) at Christie’s Hong Kong in 2017. The buyer renamed the stone — formerly the Pink Legacy — as the Winston Pink Legacy. It previously belonged to the Oppenheimer family, and had a presale estimate of $30 million to $50 million. Rahul Kadakia, International Head of Jewellery at Christie’s, explains why this spectacular 18.96-carat Fancy Vivid Pink diamond sold for CHF50,375,000 in Geneva. ‘The saturation, the intensity of this stone is as good as it gets in a coloured diamond,’ states Rahul Kadakia, International Head of Jewellery, of the Pink Legacy, an extraordinary 18.96-carat Fancy Vivid Pink diamond that sold for CHF50,375,000 in the Magnificent Jewels auction on 13 November at Christie’s in Geneva, and was promptly renamed The Winston Pink Legacy by its new owners, Harry Winston. While most pink diamonds exhibit a colour modifier like purple, orange, brown or grey, the Pink Legacy shows no trace of a secondary colour. Its even colour distribution, combined with a balanced saturation, tone and straight pink hue, qualify the 18.96 carat diamond for the coveted ‘Fancy Vivid’ colour grading from the Gemological Institute of America (GIA). Only one in 100,000 diamonds possess a colour deep enough to qualify as ‘Fancy Vivid’, and the Winston Legacy set a new record price per carat for a pink diamond. Tom Moses, Executive Vice President GIA. In the Fancy Vivid Pink range, diamonds of more than five or six carats are rarely encountered. In fact, fewer than 10 per cent of pink diamonds weigh more than one-fifth of a carat. In the saleroom, Fancy Vivid Pink diamonds over 10 carats are virtually unheard of — in over 250 years of auction history at Christie’s, only four such stones have ever appeared for sale. Driven by collector demand and an increasingly limited supply, prices for top-quality large pink diamonds has increased exponentially over the years. This booming market reached an historic level in Hong Kong in November 2017 when Christie’s sold ‘The Pink Promise’, an oval-shaped Fancy Vivid Pink diamond of just under 15 carats, for $32,480,500 — a whopping $2,175,519 per carat. The figure remains the world auction record price per carat for any pink diamond. This incomparable pink diamond has descended from the Oppenheimer Family and its sale was a major moment in auction history. Bonhams has sold a pink diamond for US$583,551 per carat, a world-record price for its colour category, the company reported. 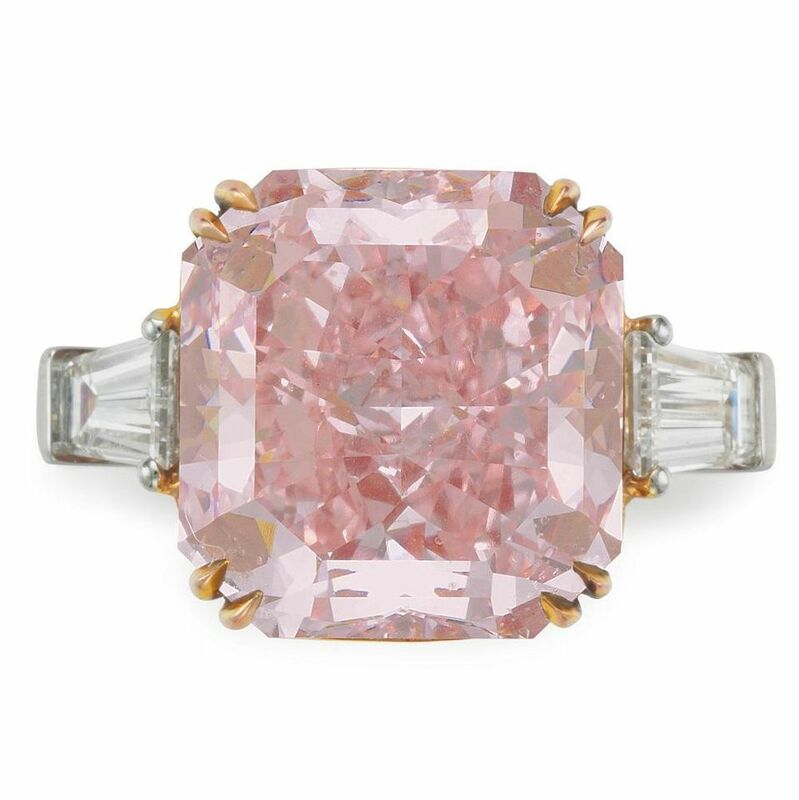 The 5.03-carat, fancy-pink VS1 garnered US$2.9 million at the auction house’s Fine Jewellery sale in London last week. The previous record for a fancy-pink diamond was US$528,021 per carat for a stone sold at Sotheby’s in 2016. The stone’s value lies in its even colour saturation, cut and size, Barber added. It is exceptionally rare to see pink diamonds over five carats on the market, she explained. Two tiaras also exceeded expectations. A Belle Époque diamond headpiece designed by Spanish royal jeweller Ansorena in the classical Greek meander style achieved GBP 162,500 ($210,650) against a presale estimate of GBP 80,000 to GBP 120,000, while a Hennell Art Deco tiara went for GBP 81,250 ($105,320), beating its valuation of GBP 40,000 to GBP 60,000 ($51,850 to $77,780). A 6.16-carat blue diamond that was secretly passed down through European royalty over three centuries has fetched USD $6.7 million (AUD $9 million) at a Sotheby’s auction in Geneva — USD $1.4 million (AUD $1.9 million) more than what experts expected it to be sold for. 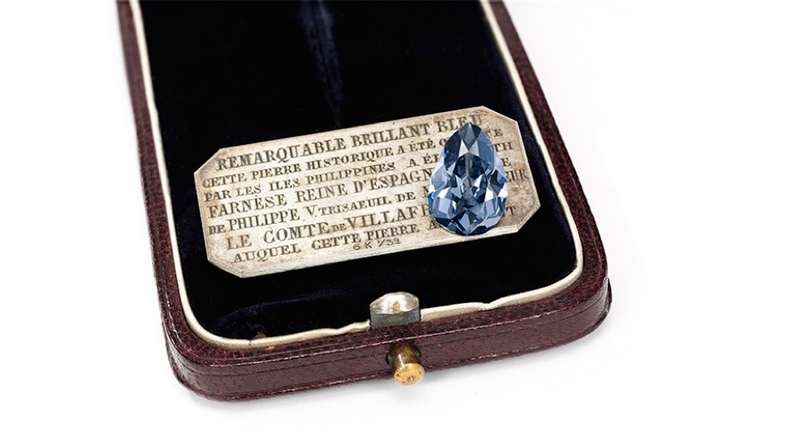 The pear-shaped, dark grey-blue gem, known as The Farnese Blue, is believed to be one of the most important historical diamonds left in private hands until today, which was the first time the stone was put up for sale. Found at India’s Golconda mines, it was given to Elisabeth Farnese, daughter of the Duke of Parma, in 1715 to mark her marriage to King Philip V of Spain. The royal couple descendants owned the Farnese Blue, as they married into other European families, travelling from Spain to France, Italy and Austria. During more than 300 years, nobody — except from close relatives and the family jewellers — knew of the gem’s existence. “All this time, it was hidden away in a royal jewellery box,” Philipp Herzog von Wurttemberg, chairman of Sotheby’s Europe, said in a statement. “With its incredible pedigree, the Farnese Blue ranks among the most important historic diamonds in the world,” he noted. The last person to own the diamond before today was one of Elisabeth’s descendants. Sotheby’s has not released the identity of the buyer. A 3.09-carat rectangular-cut fancy intense blue diamond sold for more than US$5.3 million, setting a world record price per carat for an intense blue diamond. The gem, which was set on a platinum ring flanked by tapered baguette-cut diamonds, sold for well above its high estimate of US$3 million. It was the top lot at Christie’s New York Magnificent Jewels sale held Tuesday. The auction of 211 lots achieved more than US$45.6 million, with 88% sold by lot and 96% by value. The sale was highlighted by fancy colored diamonds, colorless diamonds and signed jewels by JAR, Van Cleef & Arpels and Cartier. A ring set with an 8.42-carat cut-corner rectangular modified brilliant-cut fancy intense pink diamond, flanked by tapered baguette-cut diamonds, mounted in platinum and rose gold. It sold for just over US$5 million, within estimates. 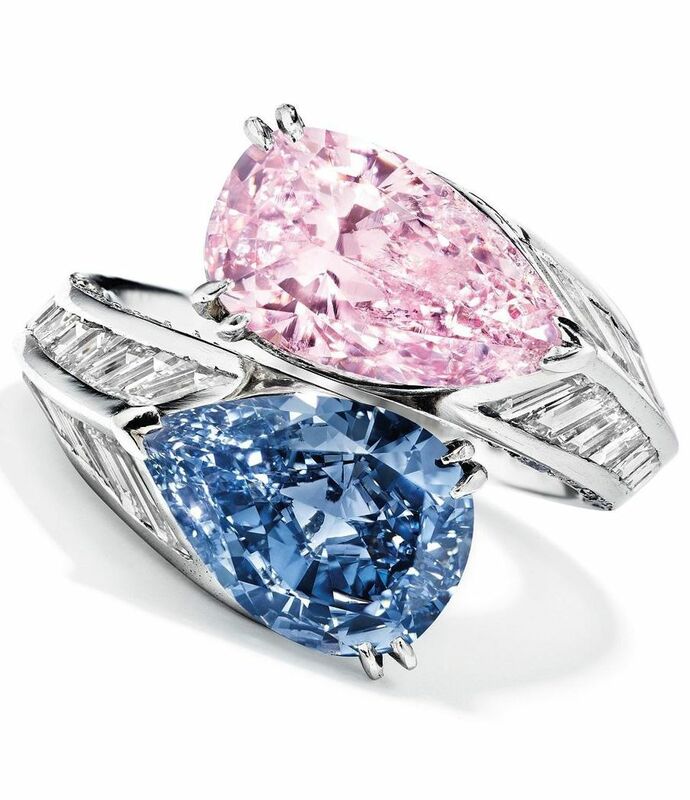 A crossover ring set with a 2.85-carat pear modified brilliant-cut fancy intense pink diamond, and a 2.42-carat pear brilliant-cut fancy vivid blue diamond, further adorned with baguette-cut diamond shoulders and circular-cut diamond gallery set in platinum. It sold for more than US$4.5 million, within estimates. A crossover ring set with a 2.10-carat pear brilliant-cut fancy vivid blue diamond, and a 1.98-carat pear brilliant-cut colorless diamond flanked by a tapered baguette-cut diamond and mounted in platinum. It sold for nearly US$3.5 million, within estimates. A diamond thread ring by JAR set with a 22.76-carat elongated oval brilliant-cut diamond within a diamond-set, two-tiered thread-work gallery and hoop, mounted in platinum. It sold for more than US$2.7 million, within estimates. A ring set with a 33.46-carat rectangular-cut diamond, flanked by tapered baguette-cut diamonds mounted in platinum. It sold for nearly US$2.3 million, beating its high estimate of US$1.8 million. A ring set with a 2.81-carat modified square brilliant-cut fancy intense blue diamond with pavé diamond shoulders mounted in platinum. It sold for US$2.1 million, besting its US$1.5 million high estimate. A large transformable emerald and diamond necklace by Van Cleef & Arpels centered with a 24.32-carat detachable oval-cut emerald that can be worn as a brooch, within a two-tier surround of circular and marquise-cut diamonds. 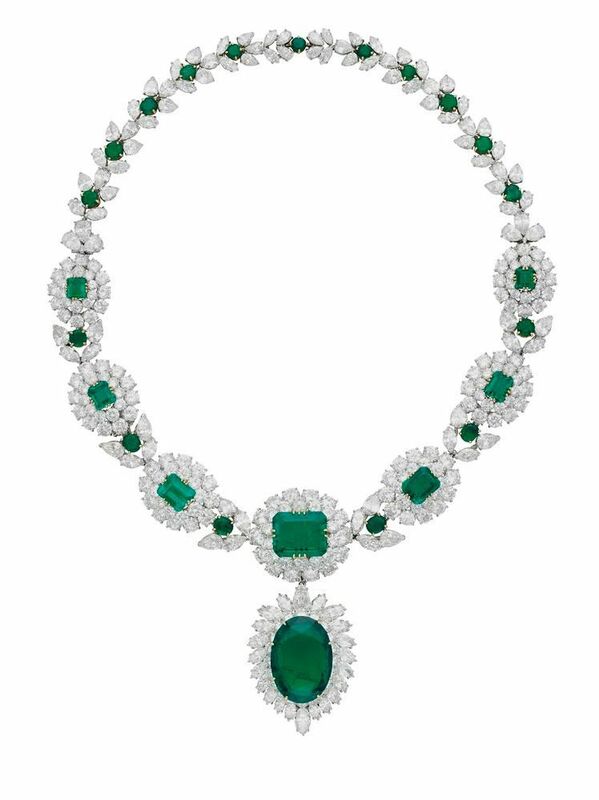 The remainder of the necklace is set with a series of seven graduated rectangular-cut emeralds within two-tier circular-cut diamond surrounds, joined by oval or circular-cut emerald, pear and marquise-cut diamond links, mounted in platinum and 18k gold. The necklace can be separated and worn as a bracelet. It sold for US$1.5 million, above its $1.25 million high estimate. A 12.19-carat round brilliant-cut diamond that sold for US$1.4 million, within estimates. A sapphire and diamond necklace by Cartier centered with a 58-carat cushion-cut sapphire, suspended beneath a 28.51-carat cushion-cut sapphire joined by 4.13-carat a modified square-cut diamond. A circular, two-row platinum and 18k white gold neckchain is accented by square-cut diamonds. This spring, the Farnese Blue, a diamond with an incredible historic pedigree, will be offered by Sotheby’s—marking the first time the gem has ever been brought to auction. Originally given to Queen of Spain Elisabeth Farnese by the Philippines to celebrate her marriage to King Philip in 1714, the gem was later owned by a descendant of France’s last queen, Marie Antoinette. Over the next 300 years, it was furtively passed down through four European royal families. The 6.16-carat, pear-shaped dark gray-blue diamond was hidden in a casket as it traveled through Spain, France, Italy, and Austria. Like the Hope Diamond, this gem is thought to have come from India’s Golconda mines. This region was the go-to source for exceptional colored diamonds up until the 1720s, when mining shifted to Brazil. The legendary diamond will be offered at Sotheby’s Magnificent Jewels and Noble Jewels sale in Geneva on May 15. Its estimated value is between US$3.7 million and US$5.3 million. Blue diamonds continue to take center stage on the international auction market. The latest entry is a Cartier ring with an 8.01-carat fancy vivid blue diamond under the name, “Sky Blue Diamond.” It is the lead item in Sotheby’s auction of Magnificent Jewels and Noble Jewels in Geneva to be held November 16. ‘THE SKY BLUE DIAMOND’, FANCY VIVID BLUE DIAMOND RING WEIGHING 8.01 CARATS, CARTIER. PROPERTY OF A DISTINGUISHED PRIVATE COLLECTION. ESTIMATE 15,000,000–25,000,000 USD. The centrepiece of Sotheby’s November auction of Magnificent Jewels and Noble Jewels in Geneva – a Fancy Vivid Blue diamond ring by Cartier – has been unveiled in London. Weighing 8.01 carats, the mesmerising stone has been named ‘The Sky Blue Diamond’, emphasising its highly sought-after hue. It will be offered on 16 November with a pre-sale estimate of USD $15–$25 million. ‘The Sky Blue Diamond’ has been graded Fancy Vivid Blue by the Gemological Institute of America (GIA) – the highest possible colour grading, awarded to no more than 1% of blue diamonds submitted to the GIA. It was also found to have excellent polish and to be of Type IIb, a rare category which represents less than 0.5 % of all diamonds. Within the past two years alone, Sotheby’s has twice set a new world record auction price for a blue diamond, most recently with the only diamond or gemstone in auction history to have exceeded $4 million per carat, the Blue Moon of Josephine (sold for $48.5 million ($4,028,941 per carat) in November 2015). * The 14.62-carat “Oppenheimer Blue” diamond, which sold for more than $57.5 million at Christie’s Geneva in May, setting a world record for any jewel sold at auction. * The 12.03-carat “Blue Moon of Josephine,” which sold for $48.4 million at Sotheby’s Geneva, November 2015, setting a world record for the price per karat for any diamond or gem at just over $4 million. * The 9.75-carat Zoe Diamond, which sold for more than $32.5 million at Sotheby’s New York, November 2014. * The 10.10-carat Millennium Blue Fancy, which sold for more than $31.8 million at Sotheby’s Hong Kong, April 2016. * The 24.18-carat “Cullinan Dream,” which sold for $25.3 million at Christie’s New York in June. If it meets or exceeds its high estimate, the Sky Blue Diamond will be among the most expensive blue diamonds ever sold at auction. On September 20, 2016 in London, Bonham’s presented a unique fancy color diamond, a rare and stunning 3.81 carat Fancy Intense Blue weighing 3.81 carats for US $3million (approx A$4million). Knowing the market supply these days, it is not easy to find such a color and size combination. When there is a request made out in the market for such a stone, it is impossible to find more than a handful of choices. Bonhams said in a statement that it holds two price-per-carat world auction records: for a Fancy Deep blue diamond at US$1.77 million per carat, and a Fancy greyish-blue diamond at US$730,000 per carat. 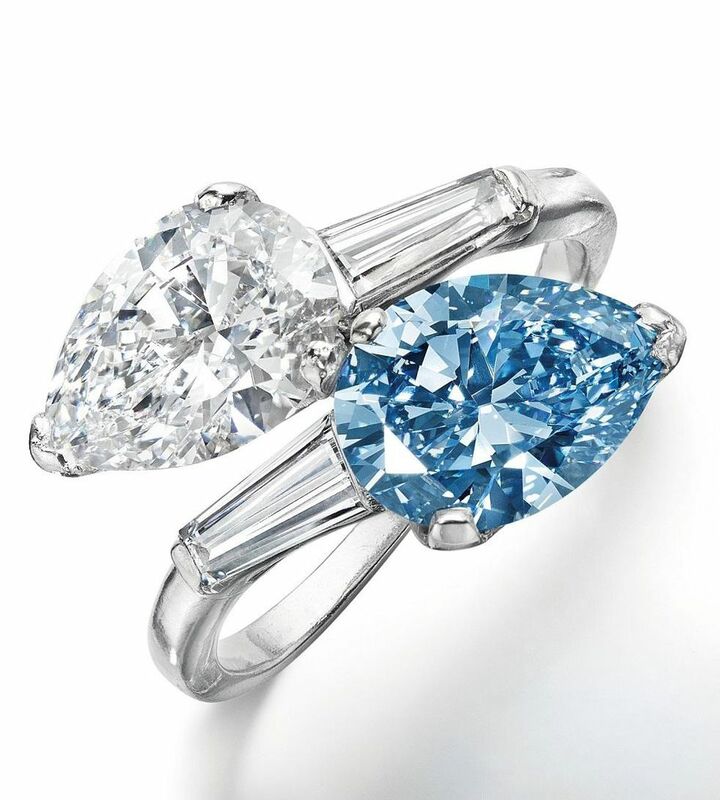 Led by exceptional fancy color diamonds, the Geneva spring auctions registered record results of almost $324 million. An array of important fancy color diamonds and a well-priced selection of quality jewels fresh to the market, once again propelled the Geneva auctions to record sales. Twelve of the combined top 20 lots were colored diamonds, amounting to more than 50 percent of the grand total. Top-quality white diamonds sold at steady prices and six white diamond lots made it into the top lots sold. Two colored gemstone lots rounded out the top 20. The sale was 83.2 percent sold by lot, with 406 of the 488 lots on offer finding a buyer. Officials confirmed they have stopped releasing percent-by-value data. By contrast, Sotheby’s November 2015 sale had realised US $139,085,346. “The Unique Pink set a new world record for a fancy vivid pink diamond,” continued Bennett, referring to the top lot of the evening, a pear-shaped fancy vivid pink diamond ring of 15.38 carats, VVS2, type IIa, which sold on the phone to an Asian private for US $31,561,200, or US $2,052,094 per carat. The second top lot, an internally flawless, pear-shaped, fancy vivid blue 7.32-carat diamond ring sold to an anonymous telephone buyer for $17,112,629, or $2,337,791 per carat. Sotheby’s also registered a new record for a jewel by Reza, with the sale of an important fancy intense blue diamond brooch for $13,672, 493. Another auction record for a fancy pink diamond was set when an 18.51-carat modified pear brilliant-cut fancy pink diamond, VVS1, type IIa, sold after intense bidding for $9,773,672, or $528,021 per carat. Christie’s sale following Sotheby’s record auction did not disappoint. Totaling $148,639,176 and registering a very high sold-by-value figure of 93 percent, the sale will inevitably be remembered for the heart-stopping bidding duel for The Oppenheimer Blue — a 14.62-carat fancy vivid blue rectangular-cut diamond ring. It set a new world auction record for any jewel, selling to an anonymous private collector for a whopping $57,541,779, or $3,935,826 per carat. The dazzling 14.62 carat blue diamond etched a record $80 million at auction in Geneva, May 18, 2016. Christie’s offered 285 lots, of which 244 were sold, representing a sold-by-lot value of 86 percent. By comparison, their November 2015 sale totaled $109.5 million and their May 2015 sale garnered $97.5 million. The top four lots were colored diamond jewels, including The Oriental Sunrise, a stunning pair of 12.20-carat and 11.96-carat fancy vivid orange-yellow oval-cut diamond and diamond earrings, which sold for $11,505,926, or $476,238 per carat. In addition, the 5.03-carat “Aurora Green” diamond set two world auction records for a green diamond Tuesday at Christie’s Hong Kong Magnificent Jewels sale, selling for more than $16.8 million. The rectangular-cut fancy vivid green diamond sold for more than $3.3 million per carat. Four white diamond lots also made the top ten list of highest-selling jewels, including The Pohl Diamond, an historic 36.09-carat, rectangular-cut, D, VVS1 diamond ring by Cartier, which sold for $4,362,432, or $120,876 per carat. It came with a working diagram stating that the gem is potentially internally flawless. A recent spate of eye-popping bids at Geneva’s semi-annual magnificent jewel auctions has highlighted the surging value of precious stones, with some of the world’s ultra-rich increasingly investing in hard assets as a safeguard against stock market volatility. The “Oppenheimer Blue”, the largest and finest fancy vivid blue diamond ever offered at auction, sold for a world record 56.837 million Swiss francs ($80.71 million) on Wednesday after dramatic see-saw bidding, Christie’s said. “It’s the most expensive jewel ever sold at auction,” said Christie’s spokeswoman Alexandra Kindermann. The rare rectangular-cut stone, which weighs 14.62 carats, previously belonged to Sir Philip Oppenheimer, who controlled the Diamond Syndicate in London. Before the auction experts ad said it was in with a chance of beating the record of $48.4 million set by Sotheby’s in November with Hong Kong billionaire Joseph Lau’s purchase of the 12.03-carat “Blue Moon of Josephine”. The packed Geneva saleroom broke into applause as Rahul Kadakia, Christie’s International Head of Jewellery, brought down the hammer after two phone bidders ended a 20-minute battle for the gem. The buyer’s identity was not immediately known. Sotheby’s fetched a record price in the Fancy Vivid Pink Category on Tuesday, when a private buyer in Asia scooped up a 15.38-carat stone for $31.6 million. Ehud Laniado, president of Cora International, which sold the stone dubbed “Unique Pink”, said he was “very happy with the sale price”, and voiced confidence that the gem’s value would rise over time. “When you buy a Picasso, you pay a lot, but you know you are going to sell it for even more,” he said. Britain’s Sir Philip Oppenheimer (1911-1995) led a powerful cartel called the Central Selling Organization for 45 years, tightly controlling roughly 80 percent of the international diamond trade in a bid to prevent wild price swings. Among his major credits was convincing the Soviet Union to sell its significant diamond reserves through his London-based cartel. De Beers, the giant mining company built by the Oppenheimer family, also flourished in the latter half of the 20th century, thanks in part to Sir Philip’s outsized influence in the sector. The blue stone has passed through several hands since Oppenheimer’s death and this week marked its first appearance at public auction. “As a general rule, these stones are quite small,” said Christie’s diamond expert Jean-Marc Lunel, noting that a Fancy Vivid Blue weighing just five carats typically generates considerable buzz in the diamond market. Last week, Canadian mining company Lucara Diamond announced the sale of a huge 813-carat uncut diamond for a record $63 million ($66.8 million). The name of the buyer for the gem, which was discovered in Botswana, was not divulged, nor the conditions of the sale overseen by Nemesis International. That record sale figure for a rough diamond is unlikely to last very long. Lucara is preparing to auction an even larger 1,109-carat diamond at Sotheby’s in London on June 29. Have already told people about this service and the benefits of doing this.